Customers requesting or ordering vehicles delivering or collecting containers to leave the road shall reimburse us in full in respect of any loss, costs, claims, damages or expenses we may sustain whether it is a result of damage to the vehicle to the container or to the property of the customer or third party including damage to the road margins and pavements. Overloaded skips will not be removed until excess has been unloaded at the customer’s liability. One clear working day’s notice is required to terminate the hiring of the container. 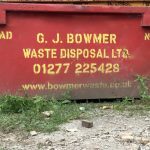 Customers undertake to fill the skip within the period of the licence granted under the Highways Act and to give us notice of its reading for collection. Skips will not be collected until payment has cleared. Customers should ensure the safe loading of materials into containers. Ownership of the contents of any container shall pass to us upon collection unless otherwise agreed in writing. In the event of the Highway Authority or the Police exercising their powers to, or to cause us to light, move or remove the container during the period of hire, the customer acknowledges that he is responsible for all costs thereby incurred. If the hirer directs the vehicle delivering or collecting a container to leave the public highway they shall fully indemnify the above company in respect of any claims losses. 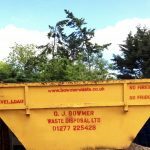 Customer’s own responsibility to see skips are not overloaded. 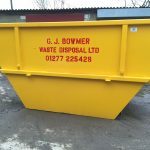 Damage to skips whilst on hire will be paid for by the customer – wear and tear excepted.